In 2005, I gave myself a year to explore different mediums of art-making, and it took all my grit to continue exploring. 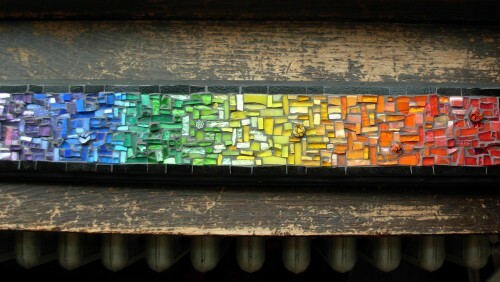 When mosaics spoke to my heart, I felt both joy and fear, because to enjoy making mosaics stirred up the the thoughts of doing the wrong thing at the wrong time, and the fear of never ridding myself of the fear. 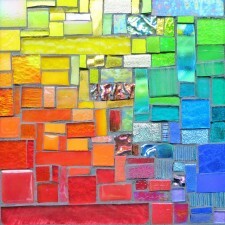 When I started making mosaics, I felt guilt that I wasn’t making collages. Collage was my first furtive kindness allowing myself to make art. Of course, when I had started making collages, I felt anxiety because I wasn’t writing poems. I had been a poet since I was 12. I won awards; I had poems in magazines; I was a Poet and had no room for any other self. My first mosaics were stepping stones, and that I continued in spite of fear, one pebble at a time, is grace. A stepping stone allows a firm footing for walking through mud, and can define a space, guide a path. As a child, stepping stones were magical, jumping from one to the next, each a self-contained world. Stepping stones are human scale. I had an anxious mind demanding superhuman scale, a leap through time, tessering. When I took a small step, there were large repercussions in my fearfulness, and yet there were also repercussions of joy. The woman I am in the studio has wisdom that I learn from every day. A woman who trusts herself, and trusts her eye, her hands, her heart. There is a fierceness in kindness, protecting the unfurling heart, a heart that loves color and pattern and intricate bits of glass. What kindness will you give yourself? If you enjoy reading the blog, you’ll want to sign up for my Standing Desk Studio Letter for a weekly epistle with what is feeding my spirit and a first look at what is emerging from my studio.